I have some pretty cool show and tell to share!!! 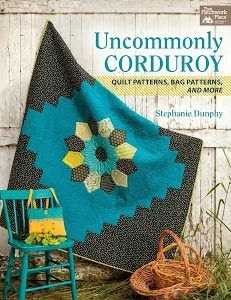 Corduroy Road is a new design by Stephanie Dunphy of Rummage blog. The pattern is available exclusively at Connecting Threads here. 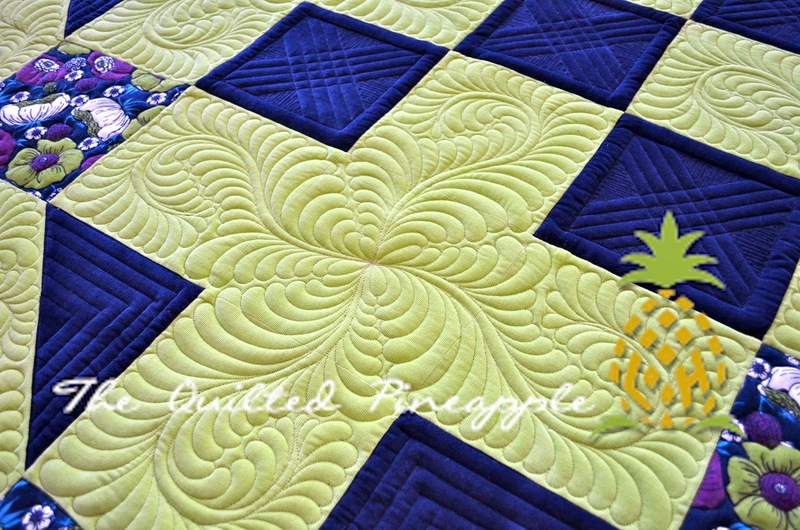 As the name of the quilt indicates, it is pieced from gorgeous corduroy. You could easily use cotton or flannel as well, but corduroy is a dream to quilt. I love it!! I love how well the quilting shows up on corduroy!!! Curvy "windmill feathers" and curling feather throughout. You can never go wrong with the addition of feathers. The soft curly shape was inspired by the "windmill feather spine." Naturally I added a little, single feather to the design. 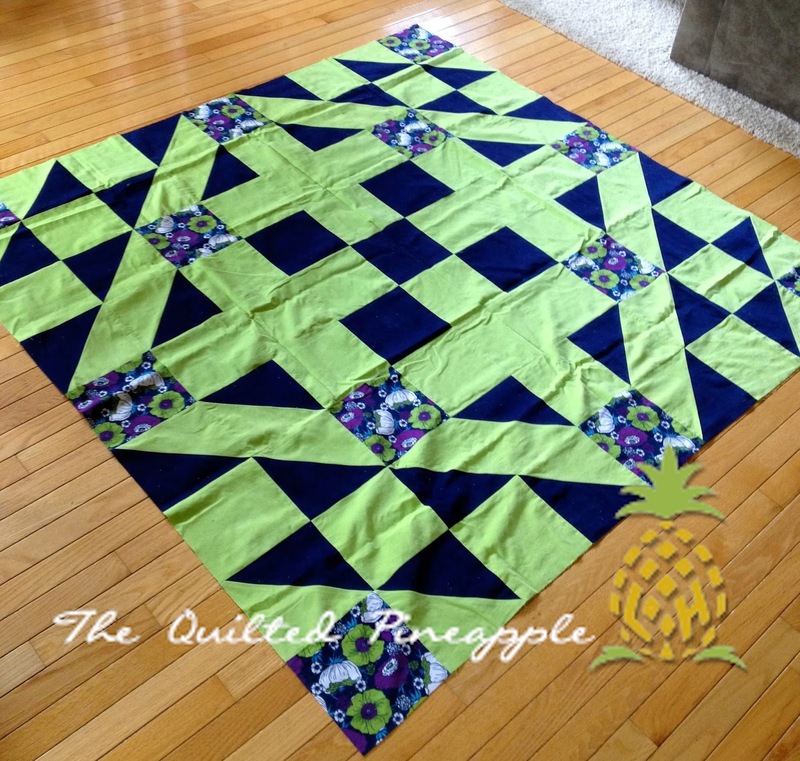 Repeating designs throughout the quilt gives the quilt continuity. I made a card stock template to ensure the design had uniformity. Micro pebbling makes the motif stand out. Love pebbles!!! I traced around my template with a purple air erasable marker and then quilted the design. 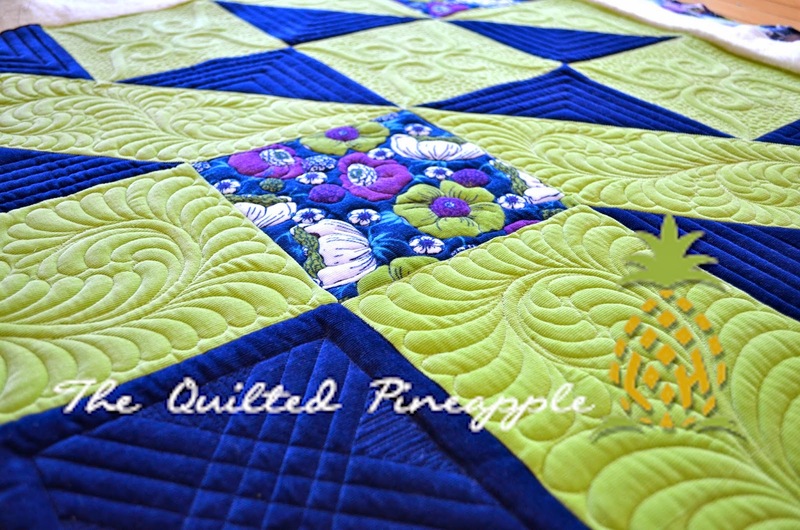 In the print blocks, I simply quilted around the flowers in the print to give the illusion of applique. 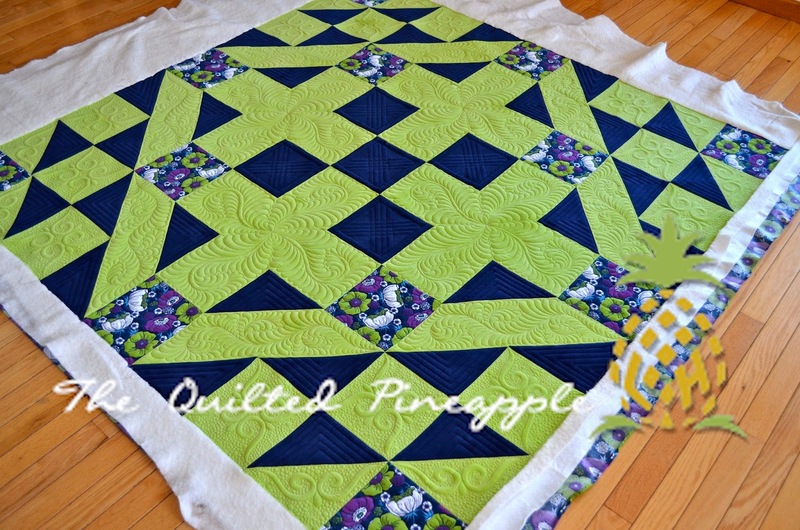 In all of the blue blocks and triangles, I have quilted a straight line design. 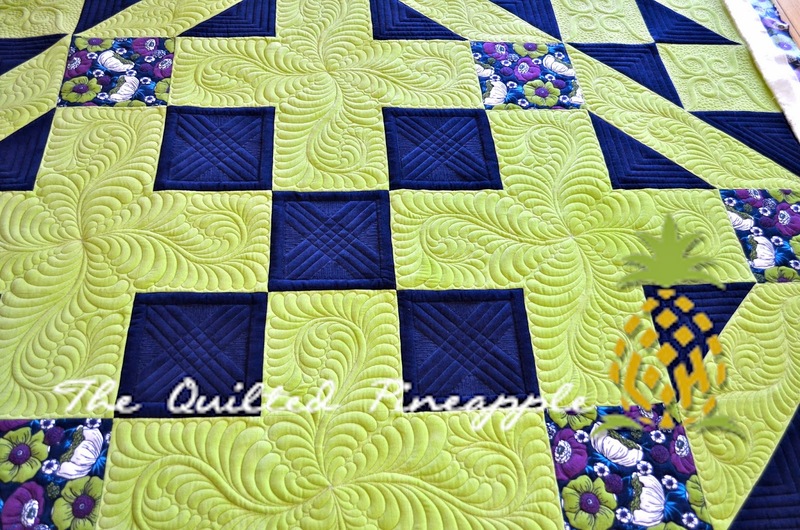 Specifics on the quilt....all quilting is freehand. So Fine threads by Superior in the top and bobbin. I used a double layer of batting. Dream Cotton with Hobbs 80/20 on top. I love to see the "before and after" transformation. Janet O. who commented "I love what you have created, Linda! Switching the colors of the pinwheels is a great idea, and, of course, your beautiful feather work is the icing on the cake! It is a delightful sight everywhere you have displayed it, but especially hanging there at the bottom of the stairs. So pretty!" Congratulations, Janet!!!! Email me your address and I will send your book out to you!!!!! Outstanding as usual Linda ... absolutely stunning!! Absolutely spectacular! The corduroy really shows off you beautiful stitching. yeah for Janet!!!! Woowhoo! 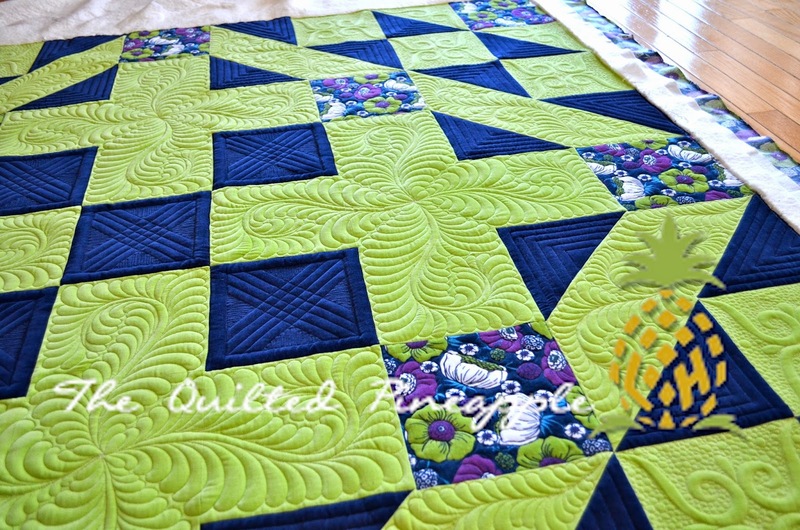 Gosh your quilting is just stunning! 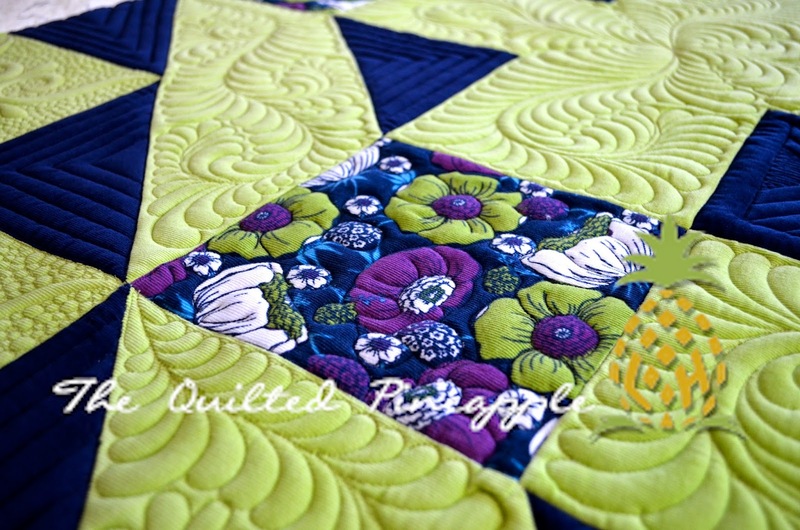 Love the textures and the way your eye travels over the transformed quilt! Linda this is just spectacular! I love the designs you choose and really appreciate you sharing the thread and batting details. Congrats to Stephanie on a lovely design. 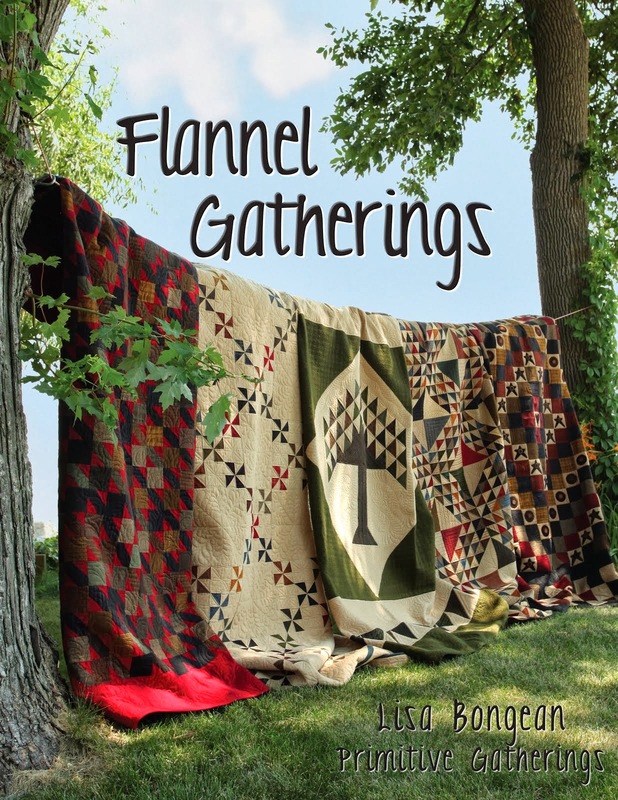 I'll look forward to quilting some corduroy - sweet! Those Windmill Feathers are spectacular! 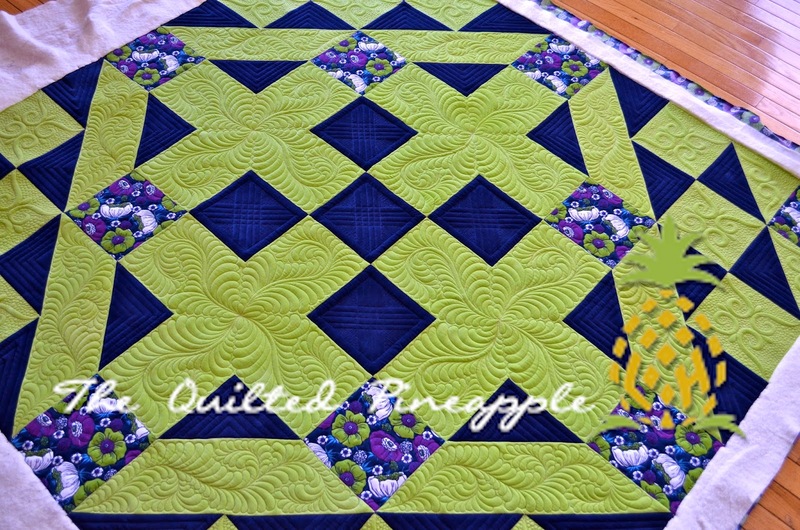 The whole quilt is beautifully quilted--need to pin this, too. 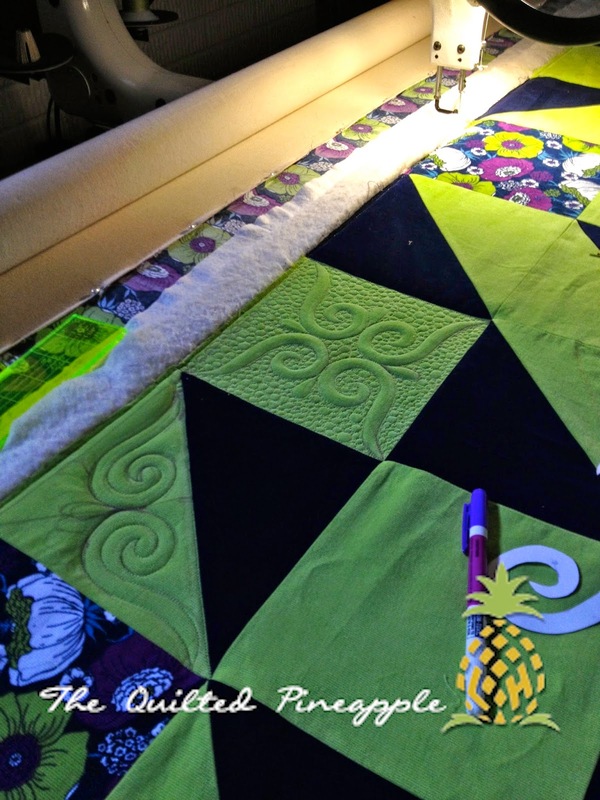 I love the quilting and really hope I can get more time to practice my quilting this winter, would love to do nice quilting on some of my quilts. Amazing quilting once again, that seems just right for this quilt. Beautiful! Stunning!! Never thought to use corduroy in a quilt. Does it have to a certain weight? Some are pretty thick. Hi Diane~ Stephanie here...I use 21-wale corduroy and it's velvety soft and cozy and sews up like a dream. 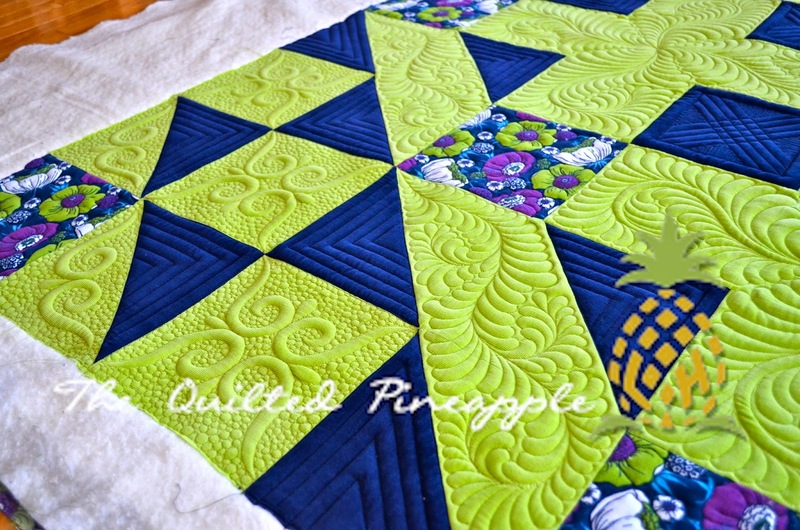 Lucky me that this quilt is mine -- I love how you see designs and put them to fabric, like an artist. You are one too! 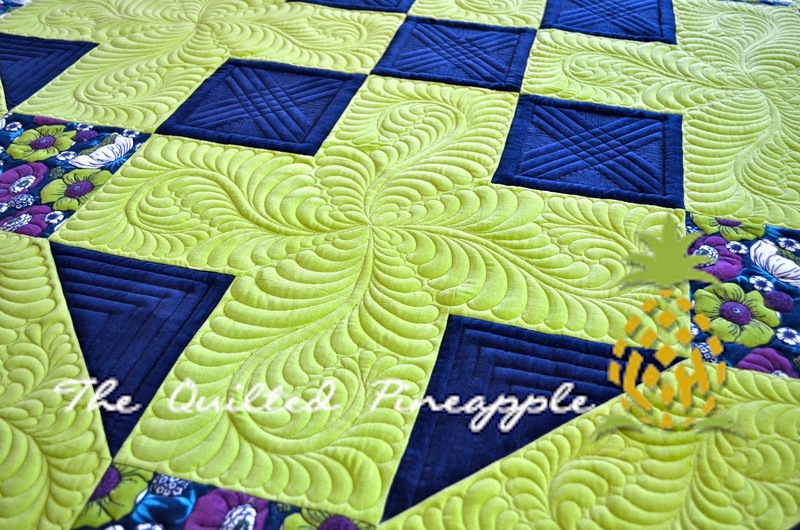 Love how your quilting gives it a 3D effect and it's so touchable! 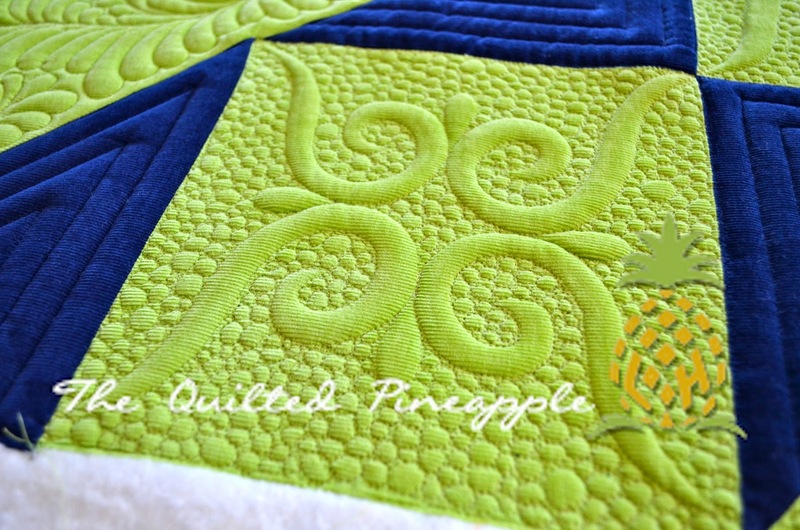 Your quilting is exquisite!! Combined with Stephanie's awesome pattern, magic was created here! Wow it really is gorgeous! I have never seen a corduroy quilt. Interesting texture which would make it perfect for this time of year. The quilting curves soften the rows of corduroy. BEAUTIFUL! Your quilting is exceptional. Where do you get corduroy fabric? I would imagine there are several thicknesses. 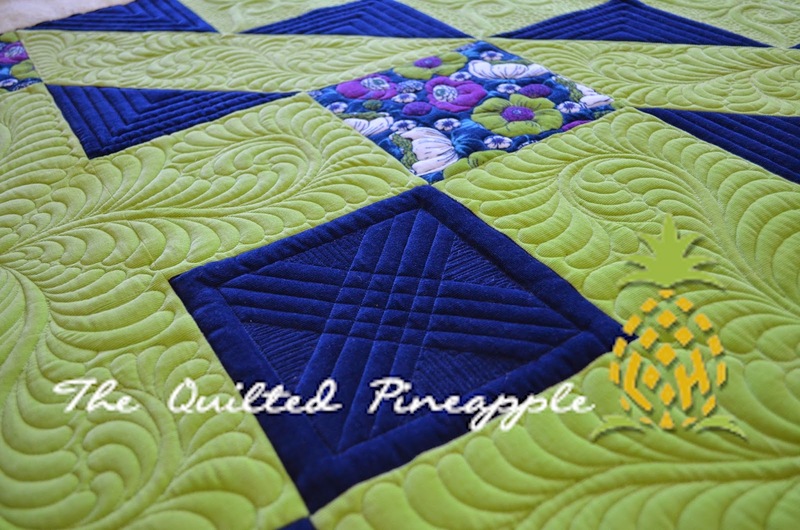 Your quilting is stunning, beautiful feathers and it is really wonderful how the flowers pop up with your outline quilting! A work of art for sure! This is just beautiful! LOVE the corduroy idea, must be very warm and cozy...your feathers are amazing! I have also made a corduroy quilt for my very elderly mum. 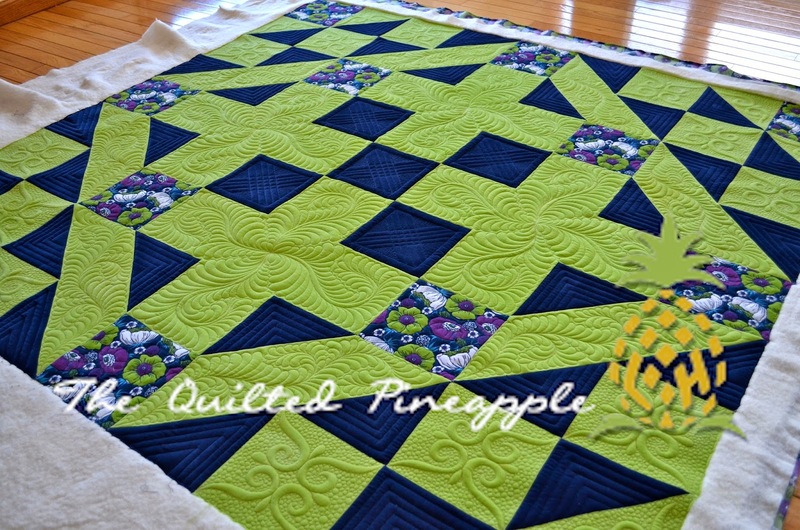 It quilted up so well that i'm really keen to do another. 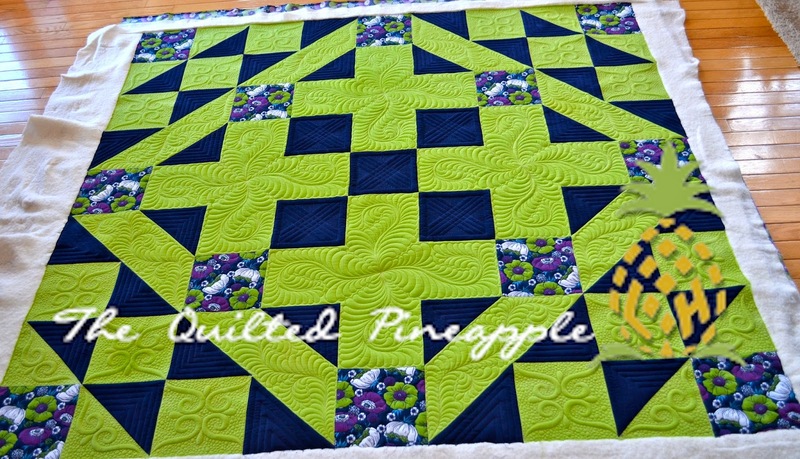 Hope I can quilt it up as well as you!